ZHONGSHAN, China — Among the carp ponds, duck farms and moldering plywood huts that have long lined the bank of a Pearl River estuary here, a most incongruous newcomer has appeared: a long, towering shed for building very large luxury yachts, a product that has no market in mainland China. Lion dancers bobbed and weaved as strings of firecrackers sizzled and boomed on July 3 at the official opening of the yacht factory — an emblem of how China is shifting its sights upmarket. Having mastered the manufacture of many inexpensive goods for mass consumption here and abroad, the country is getting into luxury goods, the kinds coveted by the world's most demanding buyers. China's competitive advantage is that it is doing this at lower cost. Increasingly expensive brands of shoes, clothing and furniture are being made in this country, mostly for domestic consumption but sometimes for export. BMW has begun assembling some of its latest models in China for sale here, and Mercedes and Cadillac are preparing to do the same. With yachts, though, China is braving a market where it has little recent experience or demand at home. The economic boom has certainly created plenty of fortunes big enough to afford yachts. 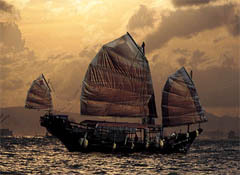 But they have never caught on among rich Chinese, who, unlike the boating set in the West, tend to keep their consumption as inconspicuous as possible. And no wonder, considering how widespread tax evasion and dubious dealings are here: few people want their lifestyles to attract official attention. 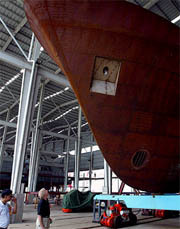 Potential buyers at Kingship Marine's Zhongshan, China, yacht factory. "You can gamble away $5 million a night, but don't buy something for $5 million and let people know about it," said Roger Liang, the Hong Kong hotel and real estate developer who is the owner and managing director of Kingship Marine, the company that built and runs the yacht factory here. Besides, China is no one's idea of a yacht-friendly place. 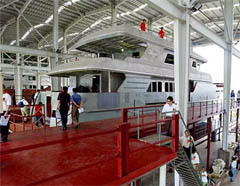 The country imposes tight restrictions on pleasure boating along its seacoast, because of concerns regarding Taiwan, and on its rivers, because of heavy barge traffic. That leaves most boaters confined to lakes inland, which are mostly too small and shallow for large powerboats. Mechanics who are able to repair modern boat engines are scarce. 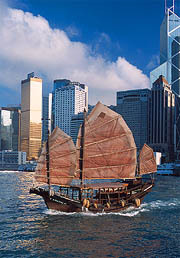 And, in a country once known for its graceful sail-powered junks, so few people now have even a rudimentary knowledge of sailing that selling sailboats in China would be a hopeless exercise, several boating executives said. Mr. Liang predicted that it would be 10 years before there would be a market in China for the 33-meter (108-foot) yachts that Kingship is building to order in Zhongshan. And it could be even longer before there is a domestic market for a 75-meter (246-foot) yacht like the one that the company is negotiating to build for a foreign buyer. So, like Cheoy Lee Shipyards of Hong Kong, which owns a shipyard a few miles downstream in Zhuhai that makes mostly commercial vessels but also the occasional pleasure craft, Kingship Marine is angling for export sales. Its first yacht has already been sold to a European buyer, said Dennis Yong, the sales and marketing director, and the company is close to a deal for a second. Both yachts were started last fall and now stand half-finished in the boatyard, their red steel hulls and dull gray aluminum cabins still in need of outfitting and paint. Kingship is trying to sell on price, undercutting the Italian, Dutch and American shipbuilders that dominate the luxury boat trade. "What would normally be a $10 million boat is $7 million," said Dean Leigh-Smith, executive manager of the Gold Coast City Marina near Brisbane, Australia. The saving, he said, is "a lot of money in anyone's language." Mr. Leigh-Smith's marina, one of the largest in the Southern Hemisphere, has 20 to 25 potential customers for Kingship yachts lined up. The marina has already sold 15 smaller boats — of 40 to 60 feet — made in China, at a Shanghai boatyard, and found the quality generally acceptable despite some initial problems with curtains, carpets, cleats and handrails. "We've had our small dramas with them, quality control," Mr. Leigh-Smith said. But, he added, "Every time we've gone to the factory and said 'we're not happy with this,' they've rectified it." As is often the case with manufacturing in China, Kingship is entering the yacht market with a lot of help from abroad. Mr. Liang is financing and directing the project from Hong Kong. He brought in Mr. Yong from Singapore. Prominent American and Dutch designers drew up the blueprints for Kingship's yachts. After starting construction of the first yacht with Chinese steel and finding it tough to get plates in the right sizes and shapes, Kingship is assembling the second one from imported steel plates, and plans to do the same with three more. The plates are forged in the Netherlands by Corus, a big European steel maker, and then cut and bent to shape there by Multi Metaal before being shipped here in containers for assembly. The engines are imported from a Caterpillar factory in Illinois, though two representatives of a DaimlerChrysler subsidiary in southern Germany showed up at the opening ceremony to promote their engines for future yachts. The generators come from Alaska Diesel Electric in Seattle. The interior lighting systems and the fabric for the upholstered chairs are also imported from the United States. So are the hinges for the shower doors. While the frosted glass is made locally, the hinges still have to be imported to make sure that the doors will open and close just right, said Olivia Liu, Kingship's interior decorator. Kingship executives say they still have a competitive advantage because they are close to Chinese factories that increasingly dominate the world in the production of many materials, and the quality of local products is improving. They plan to start buying Chinese steel plates now that Corus and Multi Metaal have generated detailed computer data on the sizes and shapes needed. Most important, Kingship has cheap labor that more than makes up for the extra shipping costs on imported parts. Security guards, who make up about a tenth of the 200-person labor force, earn $120 a month, Mr. Yong said. Specialty skilled workers, like welders certified to international marine standards, can earn as much as $600 a month, a handsome salary in this country even if it is considerably less than a European marine welder makes in a week. All workers live at the site in high-ceiling concrete barracks that, while spartan and crowded, are a big improvement over the huts nearby. Employees now sleep four to a room, though there are plans for eight to a room on bunk beds once the factory has a full order book and the work force has expanded to 500 people assembling seven vessels at a time. 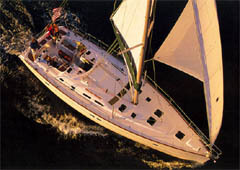 Having the workers live on site helps when a yacht has to be refitted. They can work in shifts around the clock, day and night, to make sure that a vessel is ready in time for the summer or winter cruising season, Mr. Yong said. "They want to earn more instead of idling around," he said, adding that the workers, mostly from elsewhere in China, did not have their families with them — a common practice in the country — and had little else to do. The company sent the workers away from the factory and barracks during the opening ceremony. 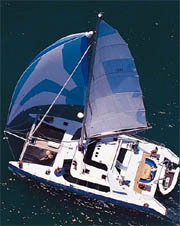 Western boat manufacturers say that the reliance here on imported parts, combined with a lack of local experience in assembling boats, means that they have little to fear. China's industry, they say, is too far behind to catch up quickly. The quality of smaller boats already on the market from Chinese manufacturers "is still very poor," said Jeffrey Seah, general manager for China, Hong Kong and Taiwan at Mercury Marine, one of the world's largest boat-engine makers and a division of the Brunswick Corporation of Lake Forest, Ill.
"Chinese technology for boat building is 20 years behind," added Mr. Seah, whose company's China operation sells and distributes engines and operates a marina, hoping to interest more Chinese in leisure boating. Lau Wai Keung, a marine engine specialist from China Engineers in Hong Kong who is helping Kingship install its Caterpillar engines, said that engines made in China were nowhere close to being competitive for use in yachts. A Chinese boat engine with the same horsepower as an American engine is 40 percent heavier and much bulkier, he said. That would mean a slower boat with a less roomy interior. Foreign producers' confidence might seem misplaced, given China's growing export success with many other products, including high technology like notebook computers. Yet in the yacht market, Chinese manufacturers will not have the immediate feedback from local customers that their colleagues in other industries get for products with domestic sales. A market has emerged for smaller vessels and marinas to hold them, and people who like the 40-footers might someday want the yachts being built by Kingship and Cheoy Lee. The China Jin Mao Group, a big property developer, has opened a boat club with a marina on the Huangpu River in Shanghai. The marina has five powerboats, up to 46 feet long and counted as commercial vessels, that can be chartered by the 1,800 club members, said Hu Yubo, the assistant general manager. Waiting lists to use the boats have the club planning to buy more. The few, determined owners of the country's large powerboats sometimes fly in mechanics from Hong Kong and even Europe. And the mechanics must cope with a shortage of docks where yachts can be lifted out of the water. 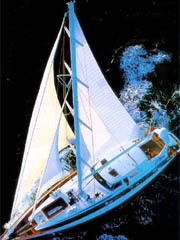 Bart J. Kimman, a yacht broker with Simpson Marine, Asia's largest yacht brokerage company, says he discourages mainland Chinese tycoons from buying yachts unless they plan to keep them in Hong Kong, as a few have, even though regulations make it almost impossible to sail Hong Kong boats into mainland China waters. But Mr. Liang, after more than two decades as a big investor on the mainland, is not entirely sorry that he will have to stick to exports. He would rather not show his yachts to too many mainlanders. "If you sell something well, someone will copy you," he said. "It happens right away."